Beirut-born singer-songwriter Tania Saleh opened the first musical performance of the 2017 Shubbak festival on July 1 at London’s Barbican Centre, weaving traditional Arab vocal styles with folk, indie rock, bossa nova and jazz. For two midsummer weeks, every two years, London becomes a global stage for Arab arts. The biennial Shubbak festival, subtitled “A Window on Contemporary Arab Culture”—a literal play on the Arabic word shubbak, which means window—gathers together writers, artists, performers, musicians and critics for dozens of events spread across the British capital, from film premieres and commissions of new dance works to debates, art installations and—almost every night—music. 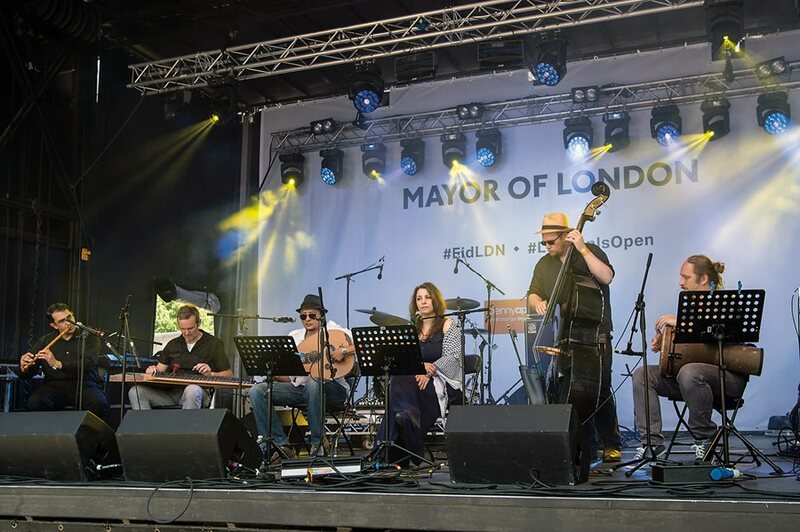 On July 2 in central London's Trafalgar Square, Shubbak musicians played sets on the main stage of the Mayor of London's Eid Festival. "We select artists because of their innovative approach and their creativity," said Shubbak's artistic director, Eckhard Thiemann. Shubbak began in 2011 as part of a series of one-off events promoted by the mayor of London showcasing world cultures from India and China to Brazil. Shubbak, however, proved so popular, and so emblematic of the fresh cultural energy rippling across many Arab countries, that it was made an independent charity charged with staging biennial editions. In 2015 Shubbak presented more than 70 events featuring 130 artists from 18 Arab countries that drew a total audience of more than 50,000 people. The 2017 festival, which finished July 16, encompassed some 80 events featuring 150 artists, and it drew similar numbers. “Our purpose is to present Arab artists to the widest possible audience,” says Shubbak’s artistic director Eckhard Thiemann, who helped produce the cultural program for London’s 2012 Summer Olympics and has worked with Arab artists in the uk over two decades. 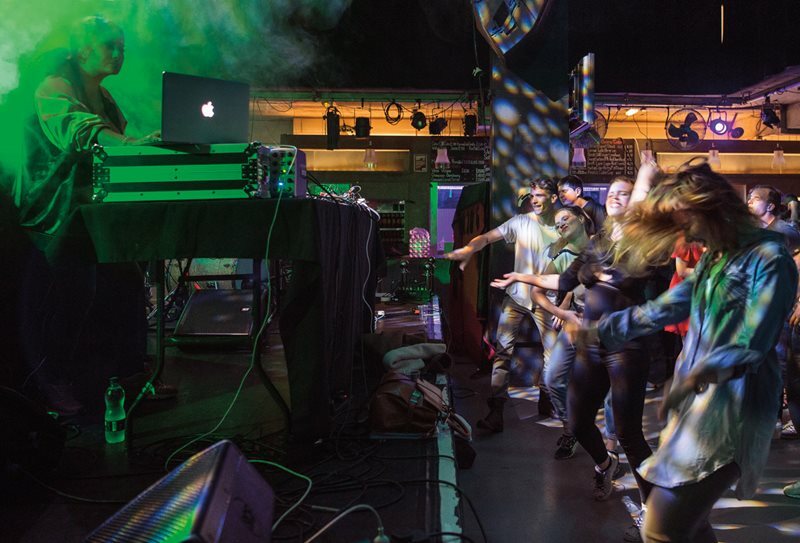 This year, alongside Shubbak’s programs in art, literature, drama and film, Thiemann oversaw a music program featuring more than 20 musicians and performers who emphasized the contemporary and the genre-busting. London-based and Syria-born virtuoso Maya Youssef performed on her 78-stringed qanun. Her graceful, accomplished playing brought echoes of Syria to new ears. “I grew up in Damascus in a house full of music, and I started learning [qanun] when I was nine. It’s been a life companion,” she says. 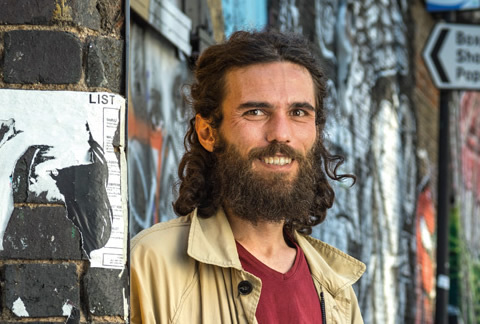 After leaving Syria in 2007 for Dubai and then Oman, in 2012 Youssef settled in the uk. She now researches ethnomusicology at the University of London and the role of music in healing post-traumatic stress among children. Rasha, born in Khartoum, Sudan, describes her genre as Sudanese jazz rooted in Arab and African music. In addition to vocals in Arabic as well as Spanish, English, Nubian and Creole, she plays 'ud and percussion. 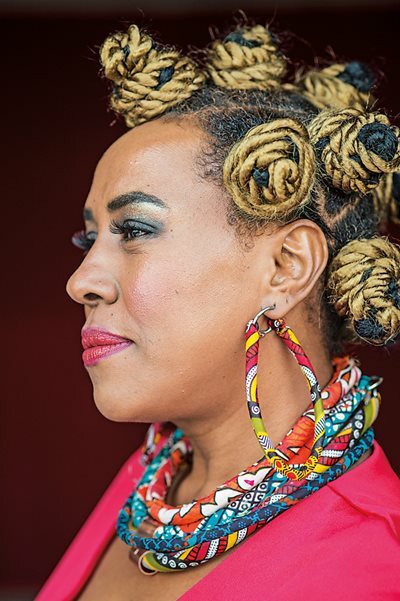 Born into a prolifically artistic family in Khartoum, Sudan, Rasha began singing professionally in 1991 after she moved to Spain, where she still lives. For her first record, Sudaniyat, released in 1997, she says she felt a calling to help introduce Sudanese music to a global audience by adapting tradition to her own personal vision of the style. Wearing cowrie shells in her hair and elaborate, patterned hoops in her ears, Rasha—she tends to drop her family name Sheikh Eldin—performed twice in one day for Shubbak: first on the main stage in Trafalgar Square and then later that evening in the intimate, historic setting of Bush Hall. Fronting a four-piece band of electric bass, saxophone, cello, and her brother Wafir on ‘ud, while accompanying herself on a stand-mounted tabla drum, Rasha sang fluid, irresistibly danceable songs of emotion and freedom that have created their own genre, which she describes as Sudanese jazz. Wael Alkak, a former member of the Syrian National Orchestra, left his country for Jordan, Turkey, Lebanon, Egypt and the us, recording folk musicians as he went. The project took the name Neshama and became a band, whose musicians drove fusions of house loops and beats with the sounds of traditional instruments at the Rich Mix venue. One thread running through almost all of Shubbak 2017’s music was the unusual, even startling, often exhilarating, experience of hearing young, intensely dynamic musicians build shattering innovations on one of the oldest foundations: Arabic popular song. As Shubbak unfolded over two weeks, I kept hearing traditional folk themes and snatches of popular melodies reinvented—none more dramatically than by classically trained, Damascus-born Wael Alkak. “I used to play the national anthem in school when I was five or six years old, on the accordion,” he remembers. Alkak, 35, sighs, pushing his unkempt hair back off his face as he tells of his recent anguish: six years of self-imposed exile from his homeland. What has sustained him are his musical roots. That first album broke many molds. Sampled clips from popular Syrian songs—some recorded shakily on mobile phones inside war-besieged cities—became the basis for wildly innovative digital reimaginings, driven by Syrian musicians recorded in Jordan on traditional instruments such as the rababa, a one-stringed Arab violin, all enhanced by Alkak’s synthesizers. Alkak directed the whole project from afar, often over video-call apps from a studio in Istanbul, Turkey. They named the project Neshama, which in Arabic “has the meaning of someone who is good just for being good, without expecting anything back,” Alkak says. Neshama earned Alkak a music residency in Paris and became the name of his band, a shifting group of musicians that now recreate Syrian popular songs for a new generation in exile. “Digital music is what we do. It includes some elements from acid house music and techno-trance music, but we build it on our recordings that we made with our musicians,” says Alkak. 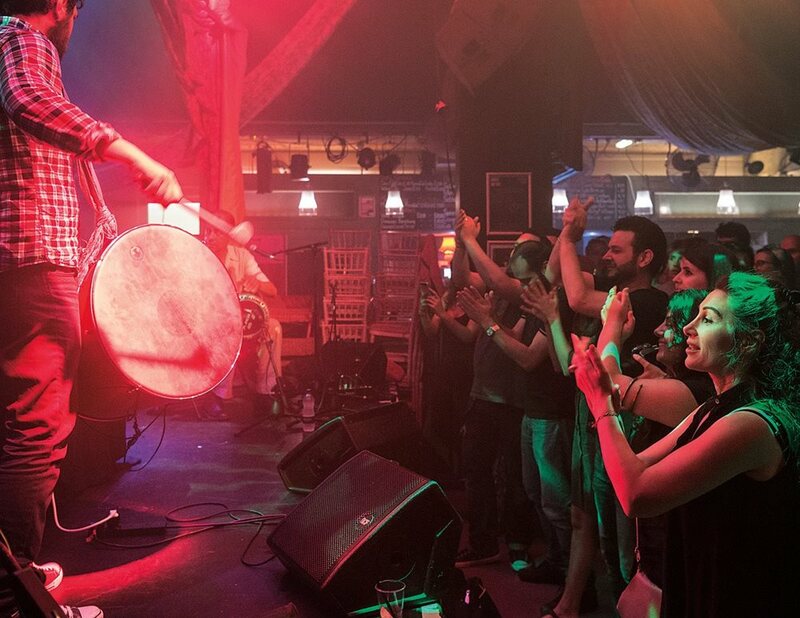 At the Rich Mix music and arts venue in London’s hipster neighborhood of Shoreditch, Alkak was joined by his brother Yazan on ‘ud and three London-based Syrian musicians, including Jammal al-Sakka, Alkak’s own percussion teacher from Damascus Conservatory. They played from Neshama’s newly released second album, Men Zaman (Long Ago). It was a wild show. Alkak—thin, blazing-eyed, shaggy-haired—worked his decks, live-mixing beats and samples. He left showmanship to al-Sakka, whose party piece was deftly flipping his tabla drum through 360 degrees midair during the most ferocious of solos without missing a beat, drawing yelps of delight from onlookers who crowded the stage and seemed to know every song intimately. Intense amplification turned traditional wedding melodies such as “Dahrij Ya Hamam” (“Dance, Pigeon!”) into desperate, swirling, rough-edged dance beats that rattled the ribcage, driven by urgent bass lines and drenched in dry-ice smoke and mood lighting. Yara Salahiddeen performs vocals for Oxford Maqam, whose Trafalgar Square set, above, revived songs of 19th- and early 20th-century Egypt, evoking a lively response in the audience. The band’s repertoire stems from some of the first recordings ever made in Egypt, on wax cylinders. Egypt in the late 19th and early 20th centuries went through a cultural renaissance of homegrown reforms and innovation known as al-Nahda (The Awakening). It energized everything from art and music to philosophy and journalism. It’s this “Nahda era” that captivates Oxford Maqam, which formed in 2008 in the city of Oxford and whose name references the melodic system of classical Arab music, explains vocalist Yara Salahiddeen. “Nahda music became marginalized in the 1950s and looked upon as old-fashioned, and I think that was unfair,” says ‘ud player Tarek Beshir. 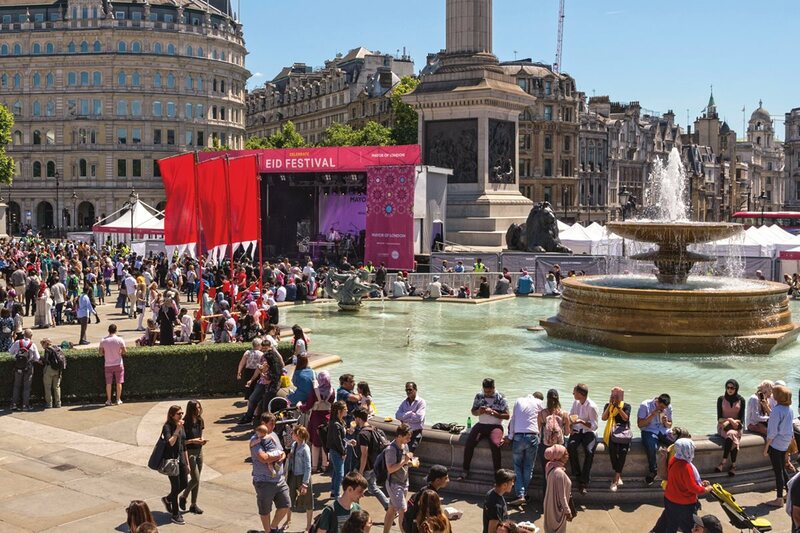 Their Trafalgar Square set, which evoked much clapping and hip-shaking, showed how skillfully they look both back and forward, with Beshir and Salahiddeen dueling on vocals accompanied by an eclectic mix of ‘ud and nay (end-blown flute) alongside acoustic double-bass. It was also during al-Nahda that the first method of recording developed, and Oxford Maqam’s debut album features new versions of al-Nahda era songs that it recorded using 100-year-old wax cylinder technology, the group first then digitized. “Most of our repertoire we know from old recordings—and the oldest of them are recorded on wax cylinders,” says qanun player and King’s College London music professor Martin Stokes. Debuting in the uk at Shubbak, Hawidro introduced audiences to an Afro-Egyptian sound that mixed historical regional influences with contemporary styling that all flowed in a smooth, jazzy style, led by rhythmic percussion and dashed with funk. “We wanted the return of our heritage, particularly our African side that has long been left behind,” the band says on its Facebook page. Hawidro is a band on a mission, “trying to represent the African Egypt in a contemporary feel,” says lead singer Ahmed Abayazeid, known to all as Zizo. On their first-ever visit to London, Hawidro played three gigs in two days under the Shubbak banner, their eight-piece ensemble driving loping, clattering percussive rhythms that blended with the fluidity of saxophone, synthesizer and electric guitar. There were few signs of nerves. 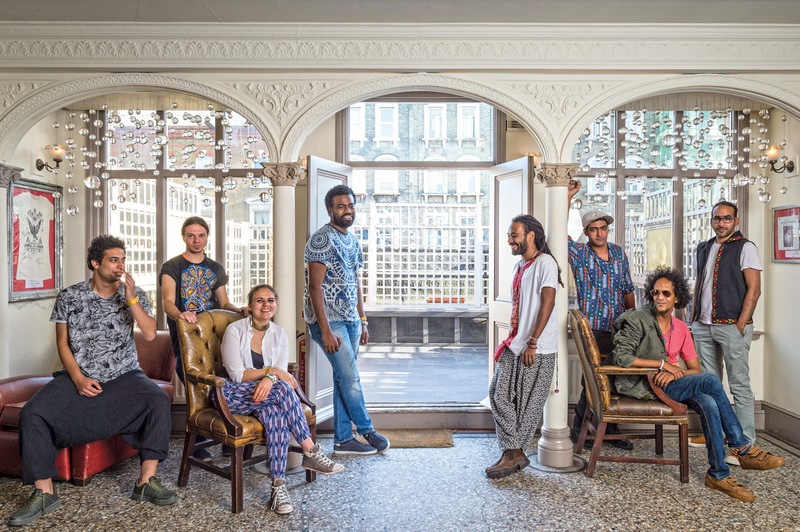 Zizo’s vibrant energy and permanent grin under long dreadlocks was contagious, and an on-stage “selfie moment” at Bush Hall drew sustained cheers and laughs. What did they make of playing in London? Nazmi was pumped. Plain dress belies Tarek Yamani's magesterial command of his instrument. 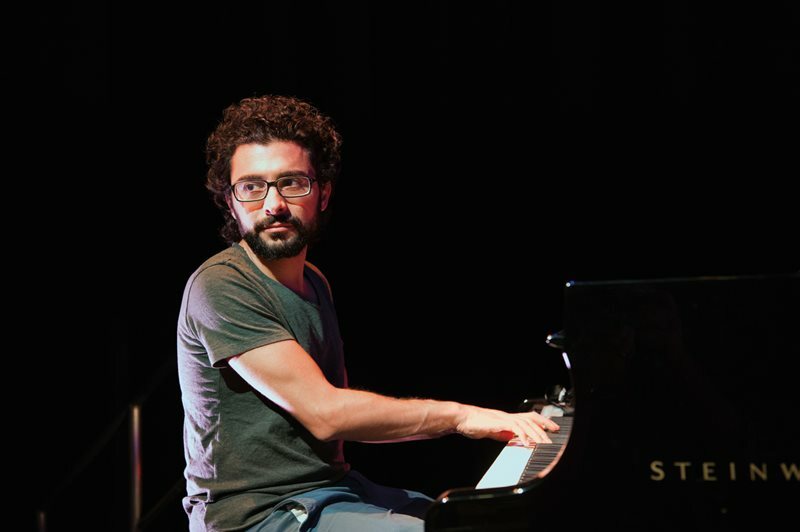 The 37-year-old jazz pianist, born in Lebanon and now living in New York, played intricate, fast-fingered grooves at Kings Place together with bass and drums. Jazz, he says, “has the secret of groove.” His latest work draws on traditional melodies and rhythms of the eastern Arabian Peninsula. 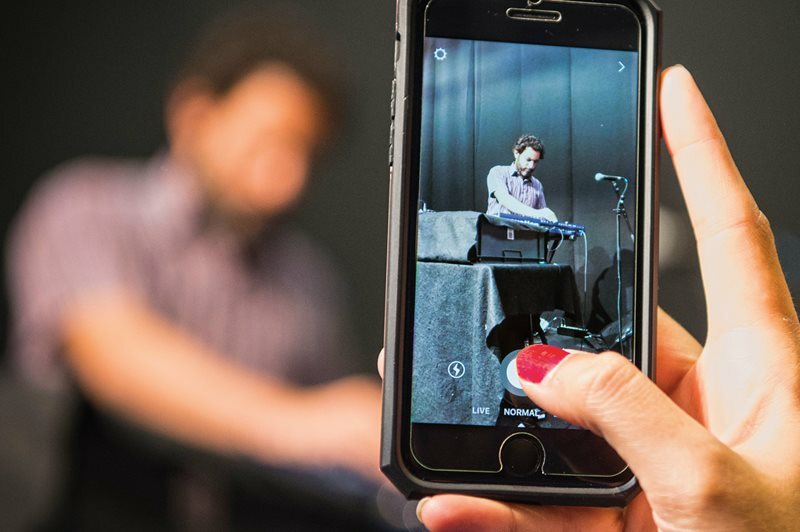 You could miss award-winning jazz pianist Tarek Yamani in the street. His figure is slight, and he wears clothes that are only remarkable for being unremarkable—plain designs in plain colors. His hair is tousled. He moves lightly, uncertainly. The fingers are a clue, if you happen to notice them: They move a lot. Spider-like. When you sit down opposite him to talk and suddenly pitch headfirst into his eyes and then find yourself scrabbling backward up a slope to keep contact with the world before he’s even said a word—that’s when you realize there is far more to this man. Yamani, 37, was born and grew up in Beirut. “When I was six, my parents discovered that I had some talent for music,” he says. Later, Yamani was enrolled in the Lebanese National Higher Conservatory of Music, but he hated it. "Jazz has the secret. It has the secret of groove. It carries African dna in rhythm, and we all carry this somehow." As a teenager Yamani lost himself in rock. “I was exposed to Pink Floyd since I was four. My father used to listen to them all the time, and the Beatles, Jimi Hendrix, Led Zeppelin. I went through heavy metal, all the way to death metal. I taught myself guitar, learned solos, made a band. And then, at 19, I discovered jazz, and that’s where this illumination happened in my life. Everything changed. For his 2017 Shubbak show, Yamani worked with long-time collaborators Elie Afif on acoustic bass and Khaled Yassine on drums—but he has not always followed convention. In 2010 he won the Thelonius Monk Institute of Jazz Composer’s Competition for Sama’i Yamani, his startlingly original rework of a traditional Arab musical form in contemporary jazz style that featured Syrian vocalist Rasha Rizk. This set the frame for exploring musical boundaries among Arab, African and African-American traditions. On his first album, Ashur (2012), Yamani fearlessly reshaped the jazz trio itself by substituting tuba for bass, bringing a unique sound while revisiting Sama’i Yamani and reimagining a traditional Arab dance form, dabke, for solo jazz piano. By then living in New York, he went deeper into Arab music for his 2014 album Lisan Al Tarab, developing classical music from Egypt, Lebanon and Iraq in a jazz trio setting. The Lisan Al Tarab track listing—lisan is an Arabic word for language and tarab refers to the trance-like atmosphere shared by performers and listeners—formed the basis of Yamani’s show at upmarket Kings Place. The trio’s effortless communication over fiendishly tricky syncopated rhythms mesmerized the crowd. Unprepossessing in a simple T-shirt, quietly spoken at the mic, Yamani created chromatic keyboard runs that felt like sweeps of bright paint across a canvas, punctuated by Yassine’s plunging off-beats and Afif’s architectural bass. Sama’i Yamani was like a call from the 19th century to the 21st, its rare 10/8 time signature and minor resolutions breaking down dizzyingly amidst chords and unpredictable beat drops over Yamani’s left-hand drone. Characteristically, Yamani is not standing still. His album this year, Peninsular, draws jazz improvisations out of the traditional khaleeji (gulf) music of the eastern Arabian Peninsula. “There’s something special about khaleeji music,” says Yamani. “The main characteristic of khaleeji rhythm is the swing, and these rhythms are all so African. “This strong need [to cling onto cultural roots] is everywhere,” he adds. 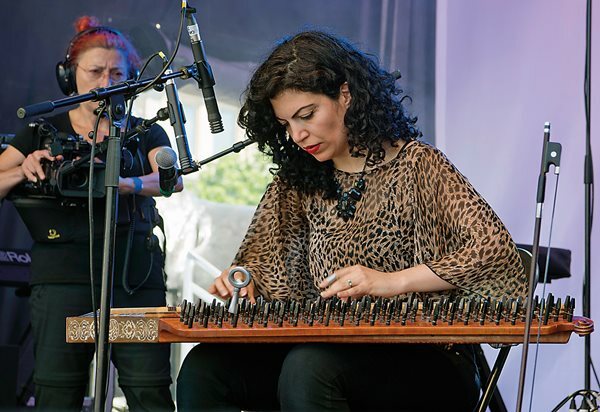 Closing out Shubbak’s musical program of more than 20 total artists was the aptly named Kahareb (Electrified), which featured five electronic artists, including Missy Ness, which is the dj name of Paris-born Tunisian Inès Abichou. 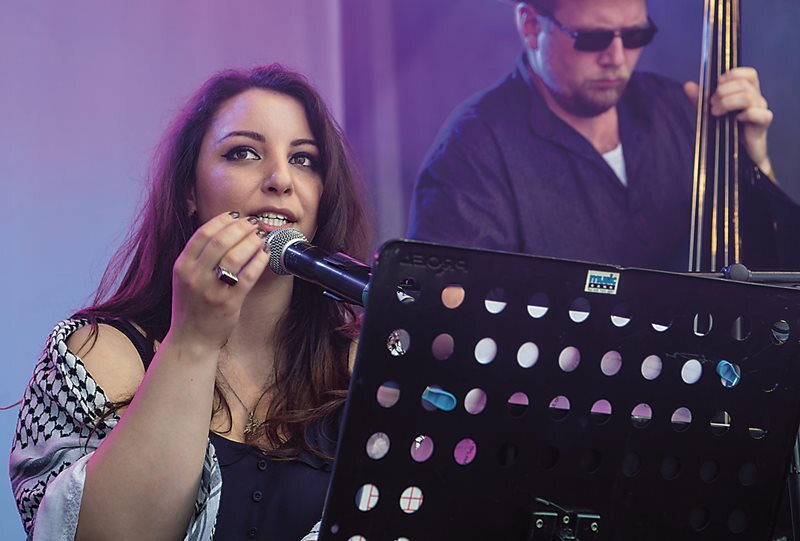 Above, she concentrates on her syntheses of traditional instruments, contemporary beats, global hip-hop and soothing Arabic vocals, all to keep the Rich Mix audience dancing. The last night of the Shubbak Festival was given over to Kahareb (Electrified), a five-hour deep dive into Arab contemporary underground electronica with multiple djs and musicians. Each performer brought a fresh perspective, from the danceability of Beirut World Beat to French-Palestinian dj Sotusura and Jordanian guitar legend El Jehaz. 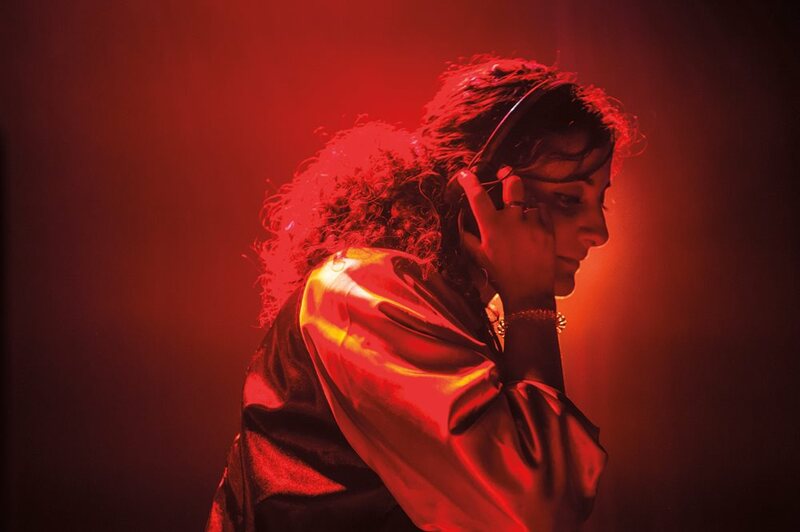 Anchoring the first half of the show was Inès Abichou, known by her dj name Missy Ness, who fused pounding British drum & bass with American rap and the hardest of Arab hip-hop. Born and brought up in Paris, Abichou became the first Tunisian female dj after hearing cult Palestinian hip-hop collective Ramallah Underground in high school. “They showed me that you can totally do this contemporary underground urban sound and mix it with Arab music without being kitschy,” she says. Inspired by the urban underground in both Paris and London, Abichou also draws on wider musical currents. So, with such vibrant contemporary sources to draw on, why does she, like so many of Shubbak 2017’s artists, look back to traditional or classical Arab music? Missy Ness played loud. She blended heavy Arabic hip-hop with all sorts of percussion and chants and snatches of American rap or bits of Egyptian song. Her hands, in constant motion over her laptop and twin turntables, swapped vinyl while her sneakers tapped along at the end of her skinny jeans and the audience danced and danced. Consciously unshowy, unassuming, Louca hesitates before telling how he picked up guitars as a teenager before he switched to keyboards and samplers in his early 20s. Something of a cult figure on the European alternative music circuit for his uncompromising sound, Louca has toured festivals and club venues there and across the Arab world for several years, but his home city remains key to his musical vision. As well as his own work, Louca plays in several bands and composes for arts, theater and film projects. For Benhayyi al-Baghbaghan, he drew on Egyptian shaabi (peoples’) pop, warping and distorting it into new forms—darker, wilder, stranger—then testing out the results with friends. Yet several tracks feature deeply traditional instruments, such as the rababa or buzuq (a kind of lute). Doesn’t that show a nod towards musical heritage? And there was precious little nostalgia in evidence on stage. Louca evoked the density and complexity of his music with beats and samples and live electronica, the hammer of Massimo Trisotto’s bass and Tommaso Cappellato’s relentless drums spinning a whirl of sound to knock you sideways. But despite headlining a bill of djs, Louca draws a firm line. Andrew Shaylor is a portrait, documentary and travel photographer based just outside London and has visited 70 countries. He works with a variety of magazines and has published two books, Rockin’: The Rockabilly Scene and Hells Angels Motorcycle Club.